Our multimode to single mode converters operate at multiple wavelengths and are great for medium conversion, or just extending transmission distance. Can be used for ATM or SDH conversions, available for many different distances and fiber types. FT-1020/2020 series equipment can be used for ATM or SDH Single mode to Multimode conversions. 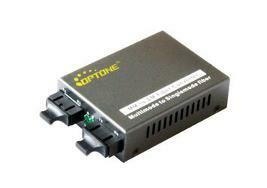 ·Supports medium convert between OC3 - OC12, OC24, STM-1, STM-4, STM-8, ATM; or to simply extend transmission distance. ·The transmission of optical mode 155M is above 30db and optical mode 1.25G is above 25db. ·Transmission distance: multi-mode ~ 2KM, single-mode up to 120KM. ·Indicator light: it indicates power supply’s condition, also suggests single-fiber and multi-fiber link condition.